Maybe Romney was right about more than Russia. He warned about military readiness, and Obama mocked him. Former President Obama mocked Romney for highlighting Russia as a major geo-political risk. Governor, the 1980’s are calling. They want their foreign policy back. And, when Romney observed that our military strength had been depleted, especially with hot spots developing around the globe, Obama took him to the hoop again. Well, Governor, we also have fewer horses and bayonets, because the nature of our military’s changed. We have these things called aircraft carriers, where planes land on them. And so the question is not a game of Battleship, where we’re counting ships. The mainstream press and other Obama supporters took the opportunity to portray Romney as old-fashioned and clueless about modern warfare. FYI: bayonets are still standard issue for marines … and all branches train recruits on hand-to-hand combat and knife wielding – a close cousin of bayonets – is a part of the training. And, while horses aren’t a primary means of troop transport, special forces are sometimes forced to use horses to reach some of the tough terrain parts of Afghanistan. The bigger issue is the size of the Navy’s fleet. Who’s right on that one: Obama or Romney? We’ll address that in our next post. USAA sends active military and veterans an insulting Memorial Day card. A couple of friends – veterans all – alerted me that USAA – the insurance company that caters to military veterans and their families has announced – on the run-up to <e,orial Day — that it’s joining with progressives and pulling ads from some Fox News programs. Financial services firm USAA is adding itself to the list of companies that have pulled advertising from Fox News Channel shows. NBC: “Trump comfortably earns the support of military-affiliated voters overall 55% to 36%”. CNN reports a poll with Trump leading Clinton. 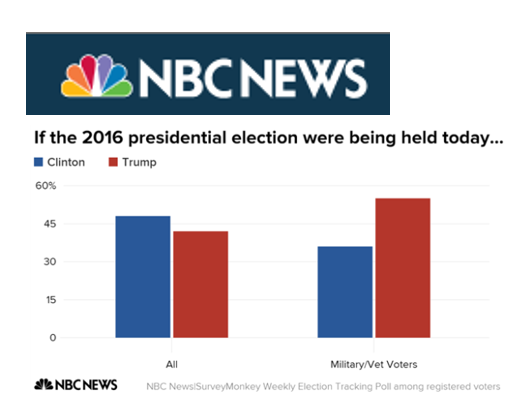 Then yesterday, NBC released a poll of military personnel & veterans. My hunch: NBC was expecting Clinton to win that poll … and probably planned to headline the results in last night’s commander-in-chief forum. While Hillary holds a slim lead across the broad base of registered voters, Trump wins big — by 19 points — among current military & veterans. Drilling down, a majority of military folks are confident of Trump’s “ability to be commander–in-chief”. 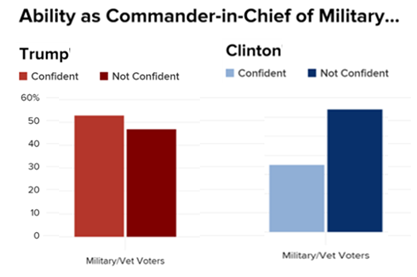 Only about 30% of military folks are confident of Clinton’s ability to be commander–in-chief. P.S. I watched the entire NBC commander-in-chief forum last night. Is 150 a big number or a little number? Last month, I ordered our military to take targeted action against ISIL to stop its advances. Since then, we have conducted more than 150 successful airstrikes in Iraq. He made it sound like a big deal … and built on the point, saying that the air strikes would continue across a wider target area. Possibly extending into Syria. Of course, the comment got me thinking … are 150 airstrikes a lot or a little? Works out to about 5 missions per day … which doesn’t strike me as up there with shock & awe.